In the course of doing yard work, we added some new plants to the front yard. Eventually we're planning to cover the entire area with decorative rock, but it was suggested that we put something down now to control dust and erosion. We were told the Bosque del Bac Habitat Restoration Mix would do the trick. It's composed of 33 species of grass, wildflowers, shrubs and trees native to the valley and foothills of Tucson. We bought enough mix to do the entire area we disturbed while cutting down and removing all the dead stuff and debris the water that runs across the property brought through. My job was to spread the seed, Ed's was to rake it in. The mix comes in small bags and my first mistake was shoving my hand into the bag to grab a handful to sprinkle around - there are tiny little burrs in it that pricked my fingers! From that point forward, I gently shook the bag and sprinkled the seed that way. Once I covered an area, Ed raked dirt over it. Some of the seeds will germinate now, some in the fall, but the woman at the Native Seeds store told us it shouldn't be too long before we see something. Maybe by the time we're ready go come off the road again, we'll be seeing some desert wildflowers! 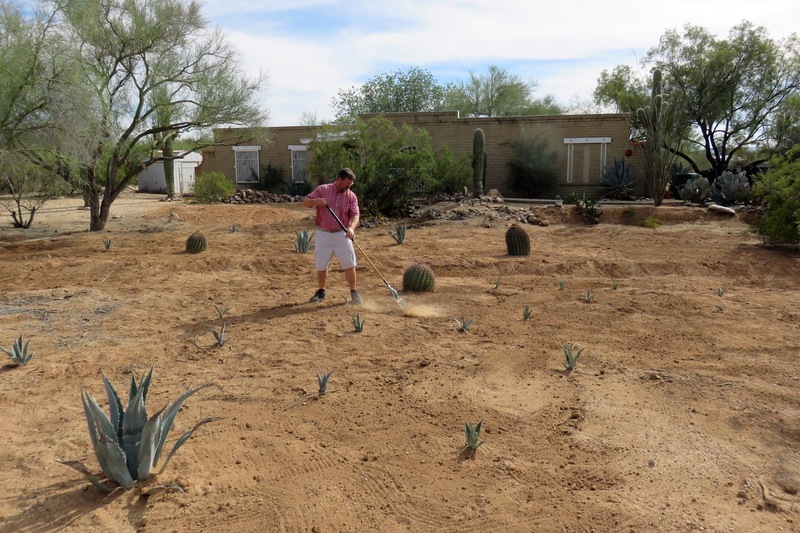 In addition to the reseeding, we planted 21 agave plants and 3 barrel cactus. As I mentioned in other posts, we're looking forward to the final landscaping design but right now, this is a great start! OMG!!! That is so beautiful! You are going to be the Star of the cul-de-sac. We can't wait to come see the fruits of all your labors.